If I put a deposit down, what happens next?? Get great veterinary pet insurance here today and help protect our pet in case of emergency! We do NOT shave the cats down for our convenience. If the cat has a nice coat, you will be handling the cat often to comb and wash faces and clip nails. How else are you going to know if your cat is suddenly feeling lighter etc if you do not handle him/her? I believe if you want the 'look' but no coat, then you should get an exotic. Kittens will have at least their first vaccine, and will have had routine dewormings. We do not have fleas, mites or fungus. Our cats are all FelV negative and FIV negative. ALL kittens will be spay/neutered/vet-checked prior to leaving. A kitten can be secured by a small deposit of $150 on a first-come/best fit basis. When someone sends us a deposit we assume it is in good faith and that the buyer has read our "should I get a kitten questionnaire" and considered all the questions to yourself. These are questions and scenarios any pet owner needs to contemplate no matter what kind of pet you get. We then modify the webpage to remove the kitten, update the record books, and transfer the funds. When the buyer changes his mind, the kitten has now lost 'exposure' as being available, the webpage needs to be modified and uploaded and funds need to be transferred back, as well as record books corrected. THE DEPOSIT WILL EVENTUALLY GO TO THE VET FOR SPAY/NEUTER. Once the spay/neuter happens, under no circumstances is it refundable from us. We can accept paypal (there is a 3.7% fee involved), but simplest! Deposits are not accepted for unborn litters, as anything can happen and it would be a bookkeeping nightmare. We keep the deposit amount reasonable in case something does happen and you cannot get a kitten. We are aware many breeders require 50% and theirs is never refundable. Once a kitten arrives, to reserve a kitten, you will need to send a $150 deposit. If you wish to put down a larger deposit that is also ok.
We will let you know when the deposit arrives via email. Our policy is that a kitten is NOT technically sold until the deposit arrives. In the event that two deposits arrive, we then go by the postmark and return the last deposit uncashed. We will try to email you pictures on a weekly basis so you can see how the kitten is growing. If we have to cancel the sale for any reason, you get your FULL deposit back if we have no other kitten to offer you of similar quality at that time or within a reasonable amount of time (less than 2 months). 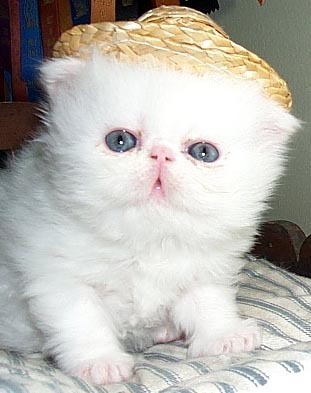 If we have offered you a similar kitten, and you decided you changed your mind, well, it is non-refundable. The deposit was taken in good faith that you wanted a kitten. Deposits are taken in good faith that you intend to purchase a kitten or cat. Be aware that 99% of all breeders don't do ANY refunds. Within the first 5 days after receipt of deposit, full refund..this is the 'cooling down' period where you decided this was not a good idea after all...I mail check back or refund paypal. Between 5-14 days after receipt of deposit, we may refund up to 50% of the deposit. After 14 days, or once the spay/neuter has occurred - no refunds of deposits!! If you cannot keep the kitten, we WILL take it back ...or we will help you place it. It really depends on how far you are from us. DO NOT DUMP THIS PET AT THE SPCA ANY ANY OTHER SHELTER!! DO NOT OPEN THE DOOR AND TOSS OUTSIDE!! We may be able to refund you some or all of the money ONCE we have re-sold the kitten, but the refund will be based on the new sale price. Be patient...it might take some to re-home with the economy as it is. We do expect that you could provide vet references and your environment for cats being placed as breeders if asked. Some restrictions apply for cats being placed as breeders. Kittens sold as pets (average $900-$1500) will be spayed or neutered prior to leaving for their new home. This is what your deposit covers! 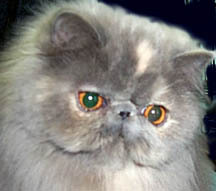 Kittens that are sold as breeders or for show are priced accordingly ($1000-$1800+). So what happens if the kitten doesn't develop as expected?? We can do a few things including adjusting the price or refunding the deposit. Once you place your deposit, we will try to take pics weekly so you can see the kitten growing. You are welcome to visit if possible. We will keep in contact letting you know of each event (vaccines, vet visit, etc). Feel free to email us to chat about the kitten. I do not get home from work until after 6 PM, and then we have stuff to do and the kitty chores, but I usually check email by about 10:30 PM. This makes phone calls kind of difficult unless on weekends...which of course, are busy too with gardening!! They must be wholly independent and eating their kitten foods and faithfully using their litter before they leave. All kittens sold as pets will be spay/neutered prior to leaving. When you get your homecoming date, you should make your vet appointment for that same week so your own vet can confirm the health of the kitten and give the 2nd vaccine. Your vet will probably then make another appointment for the 3rd vaccine and the rabies. This is an INDOOR only kitten/cat! No need to do anything with the Feline leukemia (ours do NOT have it!!) unless you have a pet that already has it. All these 'extra' vaccines are just invasive. We feed our kittens Iams KITTEN and/or Royal Canin. A treat of canned food or even raw beef is ALWAYS beneficial. If you plan on using a different food, then make the transition slowly over 2 weeks by adding a little of the NEW food to the IAMS until the switch is done. No one wants diarrhea on a long-haired cat! The kittens are used to having some wet food each day. Here we always have on hand Friskies canned. Probios right on the meat or on a tablespoon or so of Friskies. 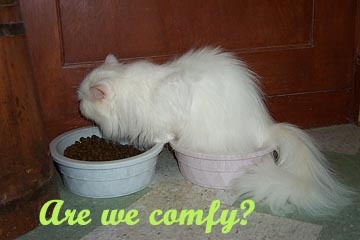 Wet food is important for male cats as part of their regular diet. If you switch, then in a couple weeks just keep adding the new food to this mix until it is gradually all the new stuff. They have been bathed regularly and I am not saying they like it, but they are very good with the bathing and the rinsing. They don't care for the blow dryer, but hey...you gotta get dry! 7 weeks: they will have had 7 days of Albon, which is just a routine treatment we do on every litter. 9 weeks: they had their first vaccine. Merial Purevax 3-way. They will be due for their next vaccine when you take them to the vet for their incoming exam. I am not a fan of constant injections. I find them invasive on a cat that is going to be an indoor cat. We we include a few toys too when we have them on hand, although I expect they will be showered with fun things. Keep in mind that this is just a little baby, so keep everything he needs all in one area so he doesn't have to go far to find anything. Eventually he will rule the house - or co-rule if there are other pets. Remember he will not know who you are, or where he is or where his mom went. 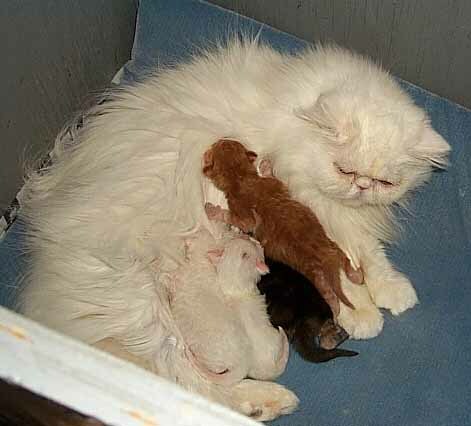 She has been a FIERCE protector of her babies driving out any adult cat from even looking at her babies! I will have all the CFA and medicals papers and contract ready at delivery. If you have any questions, let me know. Take some time in advance to read through all this as once the kitten comes home, there probably won't be time! We want an easy transition. Remember, there are no dumb questions! We are always happy to answer your questions. If we don't know, we can refer you to other resources. 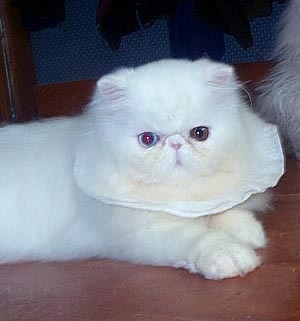 Thank you for your interest in getting a N.Y. Mews Persian or Himalayan kitten!